I made this dessert last week and added it to my top 5 list, or what the Husband refers to as the "greatest hits". It is a real keeper. The flavors are very refined and the flavors keep popping after you take the initial bite, which keeps things interesting! 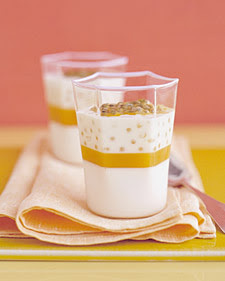 The inclusion of cardamon pods and fresh ginger make this parfait something special. It's the perfect end to any meal but would compliment an Asian-inspired meal perfectly. If you use passion-fruit puree instead of passion-fruit juice, just dilute 1/2 cup puree with water to make the equivalent of 1 cup juice. This is fantastic puree but I've heard this is excellent too. Mmmm Mmmm... I gotta come up with a reason to have you make this again!! !